Ladybugs, also known as lady beetles or ladybirds, are members of family Coccinellidae in taxonomic order Coleoptera. Darkling beetles belong to the family Tenebrionidae. Approximately 19,000 darkling beetle species are recognized; nearly 6,000 ladybug species exist worldwide. These beetles vary greatly in appearance and preferences, although a few members from each share traits with some from the other. Ladybug abdomens are almost always round and dome-shaped, their heads held below the dome of their wings. A few are slightly oval in shape. Darkling beetles, on the other hand, are almost always elongated, their bodies rounded and oval in shape. A few darkling beetles, however, are a bit more round than the standard, although rarely as round as ladybugs. Adult ladybugs range from just under 1/16 inch long to just over 1/4 inch long; some darkling beetles are well over 2 inches long. The larvae of these two types of beetles look more different than the adults do. Larval ladybugs resemble small alligators: their bodies are dark, bumpy, long and almost triangular in shape. Immature ladybugs are blackish in color with yellowish or orange markings. Darkling beetle larvae, on the other hand, are typically referred to as mealworms and are commonly encountered as live food for reptiles and other small pets. Mealworms are cylindrical and tubelike, although some are slightly flattened. Their bodies are creamy white in color. 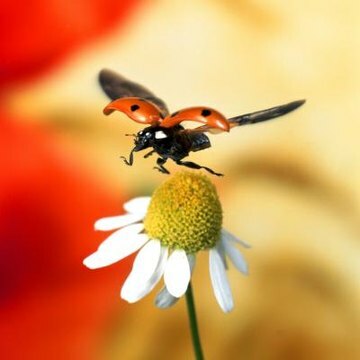 Most ladybugs are dear friends of gardeners, feasting upon aphids and other small pests that frequent ornamental plants and garden crops alike. Their benefits in the garden have made ladybugs somewhat of a commodity as ladybug larvae is sold online and at garden centers as a biological pest control. Adult ladybugs also feast on small pests, although some feed on mildew or plant material. While a few darkling beetles are formidable predators, most feed on decaying vegetable matter or decaying animal material such as carrion or dung. Because both families of beetles are so widely diverse and worldwide, habitats for each vary greatly. Both types of beetles have similar defense mechanisms. Ladybugs seep an odorous fluid from their joints when disturbed; darkling beetles will stand on their head and release an odor, giving them their other common name, stink beetles.